News and photographs about the Z07 coupe continue to surface. Reportedly due in 2000, the car will sport an uprated version of the new M5 V8 engine with 450 horsepower. That engine will motivate less than 3000 pounds of carbon fiber and aluminum. Photographs show styling cues lifted from the 507. It appears that BMW is indeed developing a sedan version of the upcoming E46 M3 in addition to the coupe. Engine possibilities range from a hold-over of the current European 3.2 liter 321 horsepower engine to a 3.4 liter engine pushing 340-350 horsepower. BMW's plundering of its sporting heritage is about to start with a revival of the 6-series coupe. The company is close to approving a project codenamed E-63, a spiritual successor to the much loved coupe that died in 1989. The car should go on sale between the end of 2001 and the summer of 2002, and if BMW does manage to secure the purchase of Rolls-Royce Motor Cars (now an increasing forlorn hope), E-63 will also form a basis of a new range of sub 100,000 (sterling) pound Bentleys. Unlike the 6-series and the soon-to-be discontinued 8-series, E-63 will be pitched higher than the Mercedes CLK or the new generation Audi A4 cabrio. The new coupe was originally intended to be based on the 5-series, but the BMW board repeatedly delayed signing off the car codenamed E-59. In the end, it was dropped. However, the project lived off behind the scenes and was revived in E-63 form when chief engineer Wolfgang Reitzle also assumed sales and marketing duties earlier this year. BMW insiders say they have learnt their lessons after the disappointing sales of the 8-series. According to one senior manager, the 8-series failed to sell well (just 1700 in 1997) because the packaging was a disaster, the car was too heavy and, in the beginning, it wasn't sufficiently powerful. Also, unlike similarly priced rivals- 911, NSX, SL - it lacked a convertible option. E-63 is no longer based on the current 5 series, but on a set of floorplan and suspension components which will also sire the new 7-series codenamed E-56 out in 2001 and the new 5 series codenamed E-60. According to a BMW engineering specialist, incorporating the coupe, cabrio into the model programme is no more complicated than producing a long wheel base 7 series. Likely to be badged 6-series, the entry-level 635ci will be powered by a 235bhp 3.5 litre V8. The mid-range 645ci will have a 4.4 litre 286bhp V8, while the range topping ///M6 should be good for 450bhp from its 4.5 litre V8. High tech options include 6-speed sequential gearbox and an active cruise control system. The cabrio will be fitted with a power-hood, pop-up rollover protection nd a comprehensive selection of airbags. BMW is projecting sales of around 20,000 E-63s a year. 3 Series Sport Wagon for US? It is possible that BMW may import a 3 Series into the US. BMW has offered wagon versions of its 3 Series chassis for the last two generations (E30 and E36), but has never imported the model to the US. With the resurgence of station wagons and the release of small wagons from Audi and Volkswagen, the A4 Avant and Passat wagon, BMW may be feeling pressure to have a small wagon in its North American model range. 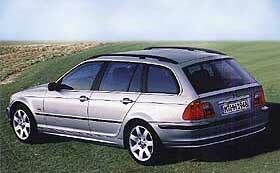 The 3 Series wagon will be released in 1999 in Europe with the updated 3.0 liter inline six. The press is in a frenzy obtaining details about the next generation M3. Rumors abound, and we've distilled them down here. There at least three rumors about the engine specification. The first is that the car will initially be offered, world wide, with a 3.4 liter 6-cylinder boasting 260 hp in US trim and 280 for the rest of the world. The power difference is due to different tuning to meet California ULEV requirements. This engine is also likely to be installed in the M Coupe when it is released here in the US in 1999. This seems in line with BMW's desire for the car to be a "world car," with similar specifications for all markets. Other sources state that the engine will be an updated version of the current 3.2 liter engine with 350 horsepower. It is unclear whether this engine will be offered in the US. A less substantiated rumor is that the car will sport a small V-8 engine with over 330 hp, perhaps later in the production run. The standard transmission in the new car will be a 6-speed, with the automated shifting SMG offered as an option. Chassis changes include 18 inch wheels and ultra low profile tires, and the possibility of BMW's EDC adjustable damping system. Body modifications are subtle, with a more aggressive air dam, side skirts, and rear valance; four exhaust outlets, and slightly flared fenders to accommodate the wider wheels. More spy pictures are available in Spyshots. Front view of new M3, featuring projecter foglights. The Sydney Morning Herald reported on Friday, May 22nd, that BMW is considering building a reincarnation of the venerable 2002. The car would be marketed as a niche car, rather than a main production model, and would not be a derivative of the Compact model. "The Compact is a mainstream model," explains a senior BMW designer. "The reborn 2002 would have to be the ultimate affordable driving machine." The new 2002 would emphasize handling and driver involvement. Return of the 6 Series? Several sources have said that BMW has given the green light to development of an E39 5 Series based coupe and convertible. The original 6 Series, produced from 1976 to 1989, was based on the 5 Series cars of the day. Assume current engine packages would carry over to the 6. Could an M6 be in the offing? According to the June 1998 issue of Automobile Magazine, BMW may produce a light weight, mid-engine, 400 horsepower, turbocharged supercar. Details are still very fluid, but the target weight of 2200 pounds will be achieved using a magnesium block for the engine and high strength steel chassis. "The new M5 is BMW's answer to the Mercedes-Benz E55 AMG, the Audi S8, and the Jaguar XJR. Sadly, the M5 looks more like a boy racer than its predecessor. The new front spoiler is positively heavy-handed, the monochromatic turn-signal lenses resemble aftermarket items, and the four large tailpipes are garish. the polished twin-spoke aluminum wheels are shod with fat 245/40ZR-18 (front) and 275/35ZR-18 (rear) tires. Under the hood lurks a new high-tech, 5.0-liter V-8--with four valves per cylinder as well as four variable camshafts--which produces 408 bhp and 370 pound-feet of torque. A six-speed manual transmission will be the only choice at first, but a sequential gearbox will be available in 2000. The new M5 will storm from 0 to 60 mph in about five seconds, with the top speed restricted to 155 mph. A spacious M5 wagon will be released about twelve months after the sedan." Europeans will be treated to two versions of the M5; sport and touring. Interior features, such as seating, and suspension calibrations will differentiate the two versions. It is unknown whether the US will be offered the two versions. With the official release of the new 3 Series sedan, the next body style to be released will be the coupe. As can be seen, the body is more rounded. The front end will have the same headlight styling as the sedan. Expect 2.8 liter and 2.5 liter 6-cylinder engines and a 1.9 liter 4-cylinder engine to power US variants. The next M3, due in 2000, is expected to be powered by a 3.4 liter 6-cylinder. BMW has been developing a sport utility vehicle, called "sport activity vehicle" by BMW, for several years now. BMW now has not chronicled the process because we believe the vehicle is not in keeping with BMW's legacy of developing sporting sedans and coupes. Additionally, with the acquisition of Rover, BMW already builds excellent SUVs. However, as the truck nears production, we've decided to cover the inevitable. The vehicle is based on the E39 5 Series chassis and will be very car-like, along the lines of the Mercedes Benz M class and Lexus RX300. Expect the vehicle to be equipped with 6-cylinder, V-8, and diesel engines. Here is a retouched spyshot of the SUV. The next iteration of the M5, based on the E39 chassis 5 Series, is currently undergoing testing in the US. Based in California, the car will be moving to Alaska for cold weather tests. The car, to be powered by a 400+ horsepower V8, sports 18 inch wheels standard. The car will be released for the 2000 model year, likely in mid to late 1999. "A successor to the BMW M3 has been locked in for a 2000 launch. Officials from BMW's M Division confirm the new model will retain the double Vanos-equipped inline six-cylinder from the current model, albeit with an increase in capacity from 3.2 liters to about 3.4. The increase in displacement will boost hp and torque to about 340 abd 270 lb ft, respectively, in European versions. At the same time, the car's rear-wheel-drive chassis is changed to incorporate a larger percentage of lightweight aluminum suspension components. Munich engineers admit to having considered a reworked version of BMW's 4.4-liter V8 for the next M3, but in the end a revised version of the existing six-cylinder got the nod. The new M3 will be launched with the E46 coupe body style, possibly in Geneva two years from next March. Sedan, cabriolet, and perhaps even station wagon versions will follow." Since this publication, some have speculated that the next M3 will be a world car with the same version sold in all markets, internationally. For the US, this would mean a car with a more powerful engine than currently offered (240 hp). However, the new car's power would be down from the European specification 321 hp to somewhere around 295 hp. As always, contradictions will be ironed out as the car nears production. The M5 is coming to America! The car is expected to sport a 400+ horsepower V8 coupled to a 6-speed sequential shift transmission (identical in action to the one currently offered in European M3s). The car is expected to be offered in the U.S. in the summer of 1998 at a price of around $75,000. Vic Doolan, the President of BMW NA, and Eric Wensberg, the M Brands Manager, were present at Oktoberfest, the annual national meeting of the BMW Car Club of America. There they revealed plans for upcoming North American models. The E39 chassis M5 will be coming to the North America. Expected to have over 400 hp, the car will be priced somewhere around $75,000. It should be available in the summer of 1998. Touring bodied cars will be available in the form of 528 and 540 models. An added twist will be the availability of manual transmissions for these cars in early 1998. The coupe version of the Z3, known as the Z5, will be coming to the United States. In addition, the M Roadster, with the M3 drive train, special suspension, wheels, and an improved interior, will also be available in the US. The US car will have the same engine currently available in the US specification M3. The 321 hp European specification engine will not be available. For pictures of the M Roadster and the M Powered Z5, visit the special M Roadster gallery. The M3 convertible has been confirmed for the US, with pricing below $50,000. The 8 Series will be dropped after the 1998 model year. Europe will soon see the release of a 6-cylinder powered Compact. The 323ti will be powered by the 2.5 liter 170-hp engine currently offered in the 323i sedan. It is unknown if this model will make it Stateside, however the 323i and 323is models will debut with the new E46 chassis 3-series as the entry-level cars. The 4-cylinder 1.9 liter motor will only be offered in the ti body style. Will there be a new M5? It appears so. Recently caught in testing is a new 5-Series sporting dual exhaust and 17 inch M-style wheels. Latest rumors are that the car will be powered by a 4.8 liter V-8 producing 400 horsepower. Some expect the engine will feature dry-sump lubrication. The car should accelerate from 0 to 60 mph in 5.2 seconds. For an advance view of the upcoming M5, check out the spy shot. Rumors are still alive for the production of an 8-Series replacement, based on the current 5-Series platform. If BMW follows past practice, it will be badged as a 6-Series. The car will be smaller and less expensive than the current 8-Series. - Road & Track, May 1997. The return of the 6-Series! The new 6-Series, based on the latest 5-Series floor pan, will replace the poor selling 8-Series. The project, code named E39/3, will sport 6 and 8 cylinder engines. We can only hope for a return of the M6. BMW is developing an extra stretch version of the 7-series. 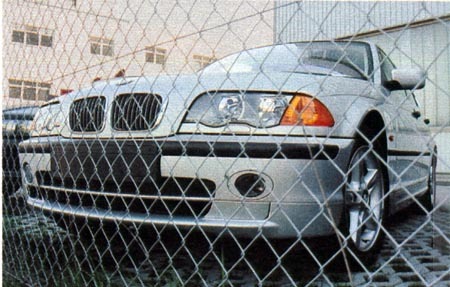 The cars are being produced by BMW Individual and are usually armored for passenger protection. According to Britain's CAR Magazine, BMW will produce 2000 examples of the M Compact! The car, based on the 318ti chassis will sport the 321 horsepower 3.2 liter M3 Evolution engine. This should result in acceleration from 0-60 in approximately 5.2 seconds, owing to the lower weight (by 200 pounds) of the ti body style. The car will be released in late 1997. There has been no announcement about importing the car to the US. The rumored flagship of the BMW line, the Z12 (formerly noted as Z8) roadster is rumored to be entering its road testing phase. The car's styling will take cues from the 507 roadster produced in the late 1950's. The Z12 will be powered by V12 or V8 engines (presumably resulting in the Z8 tag) with a 5.6 liter, 500 horsepower version of the McLaren V12 possible. The V8 will likely be the M5's 4.8 liter 400 horsepower power plant. I suppose the M5 lives! Due in 1998 is the widely rumored Z8 coupe. Based on the 3-Series (E46) chassis with the E39 5-Series rear suspension, the car will likely be powered by the 4.4 liter V-8, with the 5.4 liter V-12 as an option. The car will feature all of the latest technologies that BMW can muster. The car is expected to sell for more than $100,000. See the spy shot and artists concept.